Procedure 1.9, "To Move Data from a PDB Backend to a JE Backend"
Procedure 1.10, "To Install OpenDJ REST to LDAP Gateway"
Procedure 1.11, "To Install OpenDJ REST to LDAP Gateway (3.0)"
Procedure 1.12, "To Install OpenDJ DSML gateway"
Unzip opendj-3.5.3.zip, and then run the setup command, described in setup(1) in the Reference. When you unzip opendj-3.5.3.zip, a top-level opendj directory is created in the directory where you unzipped the file. On Windows systems if you unzip opendj-3.5.3.zip, with Right-Click > Extract All, be sure to remove the trailing opendj-3.5.3 directory from the folder you specify. Unzip opendj-3.5.3.zip in the file system directory where you want to install the server. Before you install OpenDJ, install a Java runtime environment if none is installed yet. List the indexes configured for the PDB backend. For instructions, see Section 4.2, "Importing and Exporting Data" in the Administration Guide. For instructions, see Section 4.9, "Deleting a Database Backend" in the Administration Guide. For instructions, see Section 4.5, "Creating a New Database Backend" in the Administration Guide. Create the same indexes for the JE backend that were present in the PDB backend. For instructions, see Section 7.4, "Configuring and Rebuilding Indexes" in the Administration Guide. Import the data from LDIF into the JE backend. # Copyright 2017-2018 ForgeRock AS. echo "Export from PDB failed." The OpenDJ REST to LDAP gateway functions as a web application in a web application container, running independently of OpenDJ. Alternatively, you can use the HTTP connection handler in OpenDJ directory server. For instructions see Procedure 5.8, "To Set Up REST Access to User Data" in the Administration Guide. For details, see Section A.1, "Gateway Configuration File" in the Reference. For details, see Section A.2, "Gateway REST2LDAP Configuration File" in the Reference. You can edit this file, and define additional files for alternative APIs and versions of APIs. For details, see Section A.3, "Mapping Configuration File" in the Reference. Deploy opendj-rest2ldap-servlet-3.5.3.war according to the instructions for your application server. primaryLDAPServers: Set to the correct directory server host names and port numbers. authentication: Set to the correct simple bind credentials. The LDAP account used to authenticate needs to perform proxied authorization as described in Section 3.8, "Configuring Proxied Authorization" in the Directory Server Developer's Guide. The default sample configuration configuration is built to work with generated example data and also the sample content in Example.ldif. If your data is different, then you must also change the JSON resource to LDAP entry mapping settings, described in Section A.3, "Mapping Configuration File" in the Reference. For details regarding the configuration, see Appendix A, "REST to LDAP Configuration" in the Reference. If you generated example data, Babs Jensen's entry is not included. Instead, try a URL such as http://user.0:password@opendj.example.com:8080/rest2ldap/api/users/user.0. The OpenDJ REST to LDAP gateway functions as a web application in a web application container, running independently of OpenDJ. Alternatively, you can use the HTTP connection handler in OpenDJ directory server. For instructions see Procedure 5.12, "To Set Up REST Access to OpenDJ Directory Server" in the Administration Guide. This procedure applies to OpenDJ REST to LDAP gateway 3.0. 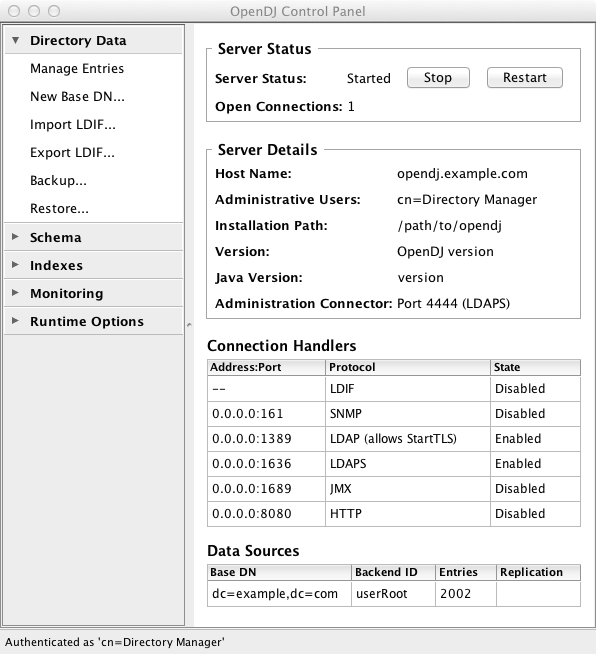 If you are using OpenDJ REST to LDAP gateway 3.5, see Procedure 1.10, "To Install OpenDJ REST to LDAP Gateway". Deploy opendj-rest2ldap-servlet-3.5.3-servlet.war according to the instructions for your application server. Deploy opendj-dsml-servlet-3.5.3.war according to the instructions for your application server. If the OpenDJ directory server version is older than 2.6.0, you must upgrade your deployment to use at least OpenDJ directory server 2.6.0 before following the procedures in this chapter. For details on upgrading to that version, see Upgrading to OpenDJ 2.6.0. Procedure 2.2, "To Upgrade to OpenDJ 3.5"
Example 2.1, "Upgrading to OpenDJ 3.5"
When you upgrade to OpenDJ 3.5 from an OpenDJ 3 or earlier, the upgrade procedure leaves the HTTP connection handler disabled. The newer configuration supports inheritance and subsresources, but is not compatible with the previous configuration. You must rewrite your configuration to the version described in Appendix A, "REST to LDAP Configuration" in the Reference, and then reconfigure the server to use the new configuration. For details, see Section 5.8, "RESTful Client Access Over HTTP" in the Administration Guide. If you are not upgrading to the OEM edition from OpenDJ 2.6, then this procedure does not apply. Skip instead to Procedure 2.2, "To Upgrade to OpenDJ 3.5". The OpenDJ directory server upgrade process is designed to support a rolling (sequential) upgrade of replicated servers. Upgrade the server as described above. If some applications depend on Internet-Draft change numbers, see Procedure 8.19, "To Align Draft Change Numbers" in the Administration Guide. Rewrite your configuration to work with the new formats described in Appendix A, "REST to LDAP Configuration" in the Reference.